Picture of AV for You set up at Latitude 45 Apartments in Mpls. 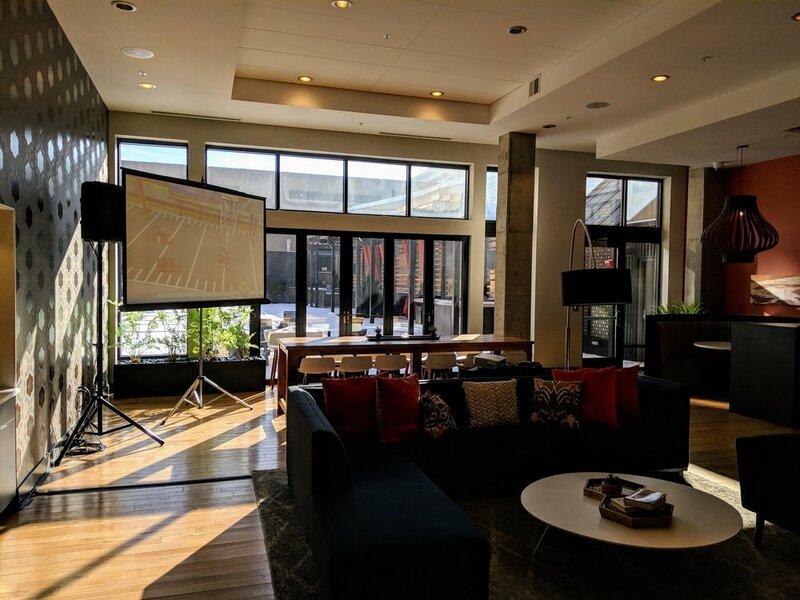 AV for You set up audio and video for a Super Bowl party at Latitude 45 Apartments. For audio we set up an RapcoHorizon LTIBlox Laptop Audio Adapter and two JBL Eon 610 Powered Speakers on stands. One speaker was next to the screen to provide audio for those watching the superbowl, the other was set up in the larger space adjacent to this to provide sound for those hanging out. For video we front projected our NEC 3K HD Projector onto our Da-Lite 8' Tripod Screen. We extended the RF cable so we could set the cable box next to the projector and provide a feed of the Super Bowl to the projector.